sRNAPrimerDB is a comprehensive web primer or probe design tool specifically for small non-coding RNAs (sncRNAs), such as microRNA (miRNA, 20-25 nts), PIWI-interacting RNA (piRNA, 24-32 nts), short interfering RNA (siRNA, 20-25 nts), etc. Detailed experimental procedures for each method can be found in the protocol page. In addition, sRNAPrimerDB is also a primers bank, which contains tens of thousands of primer pairs for detecting miRNAs and piRNAs. Primers for sncRNAs that have been experimentally validated are encouraged to submit an online application form by visiting our web site at http://123.57.239.141 or www.srnaprimerdb.com. Shengsong Xie†, Qin Zhu†, Wubin Qu†, Zhong Xu, Xiangdong Liu, Xinyun Li, Shijun Li, Wubin Ma, Yiliang Miao, Lisheng Zhang, Xiaoyong Du, Wuzi Dong, Haiwei Li, Changzhi Zhao, Yunlong Wang, Yaping Fang* and Shuhong Zhao*. 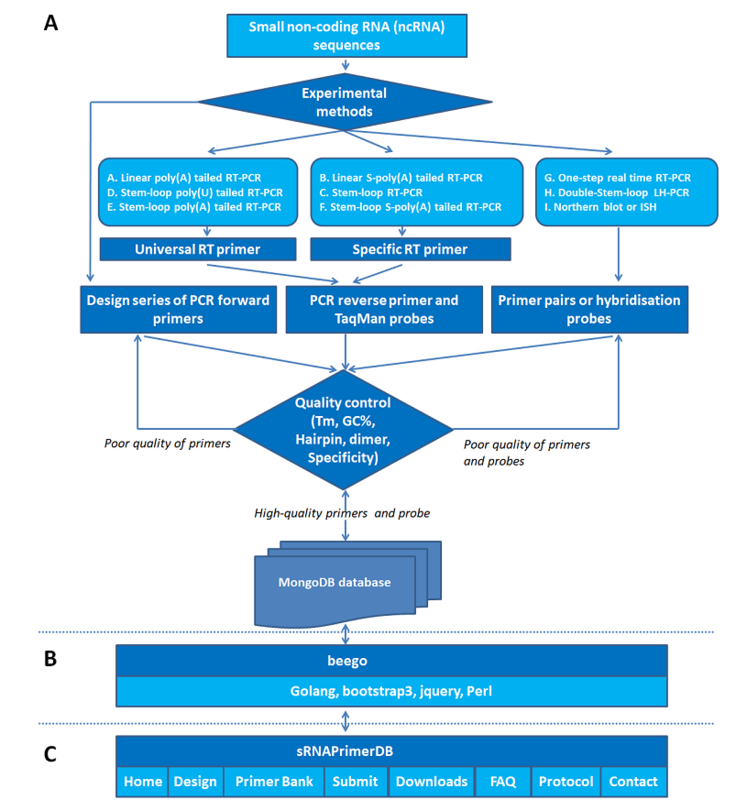 sRNAPrimerDB: Comprehensive primer design and search web service for small non-coding RNAs. Bioinformatics, 2018, Doi:10.1093/bioinformatics/bty852.